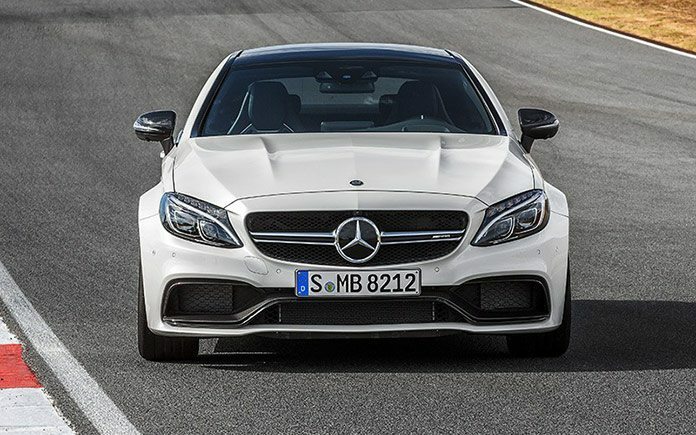 Mercedes-AMG is setting a further landmark in the brand history: the new C 63 Coupé is the next step on the way to yet more technical and visual distinctiveness. The profound technical modifications are evident at first sight: strikingly flared front and rear wheel arches, an increased track width and larger wheels give the Coupé a muscular look while at the same time providing a basis for the highly agile longitudinal and lateral dynamics. 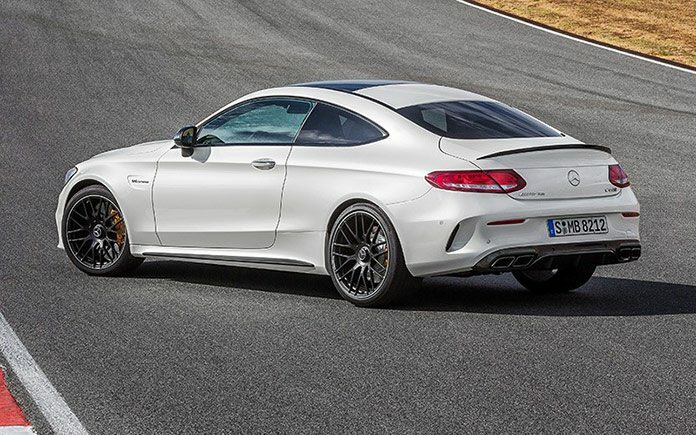 The Mercedes-AMG C 63 Coupé fascinates even at first glance with its impressive proportions. The expressive exterior design differs significantly from the standard Mercedes-Benz model, which shares merely the same doors, roof and boot lid. The powerful eight-cylinder engine as well as the wider track of the front and rear axles call for a redesigned front end, a model-specific rear assembly and new side walls. 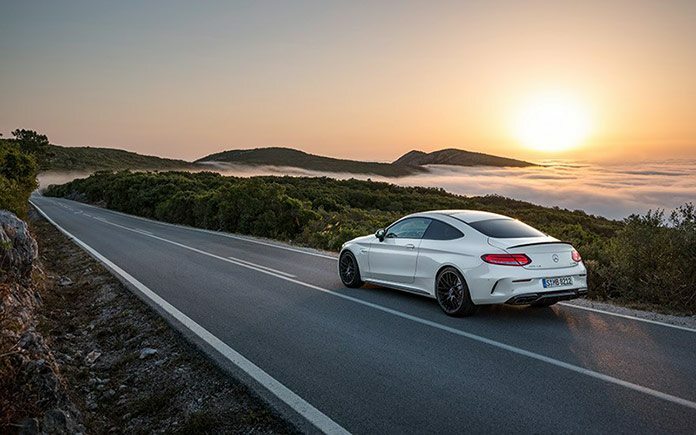 The flared wheel arches make the AMG Coupé 64 millimetres wider at the front and 66 millimetres wider at the rear, enabling the vehicle to hug the road better. 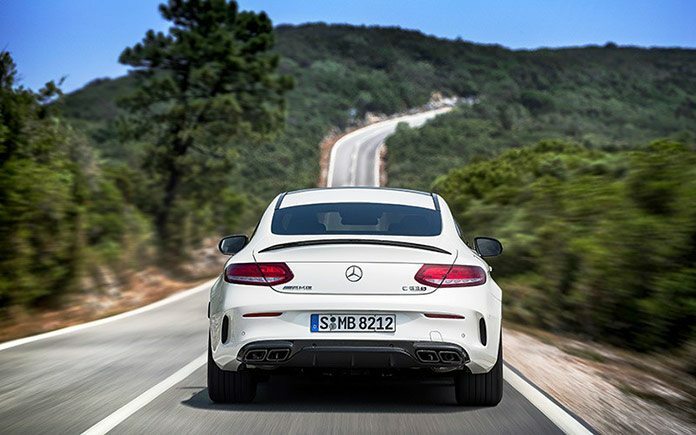 Taking its inspiration from the S-Class Coupé, the completely redesigned rear end includes a diffuser insert that invokes a typical feature from motor sport. The special design of the laterally positioned, optical air outlet openings improves the rear air flow, allowing it to break away with aerodynamically advantageous precision. Features such as the narrow rear reflectors reinforce the impression of width. 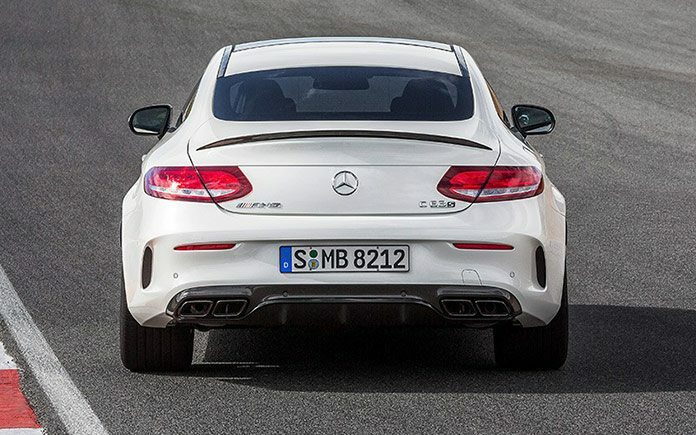 The two chrome-plated twin tailpipes of the exhaust system are perfectly integrated into the diffuser. The boot lid includes a narrow spoiler lip in the form of a sharp blade. It not only looks elegant, but also produces more downforce on the rear axle. The instrument panel is trimmed with black ARTICO man-made leather. Crystal grey topstitching, the wing-shaped aluminium trim and the AMG-specific analogue clock in IWC design (depending on specification) underscore the high-quality impression. 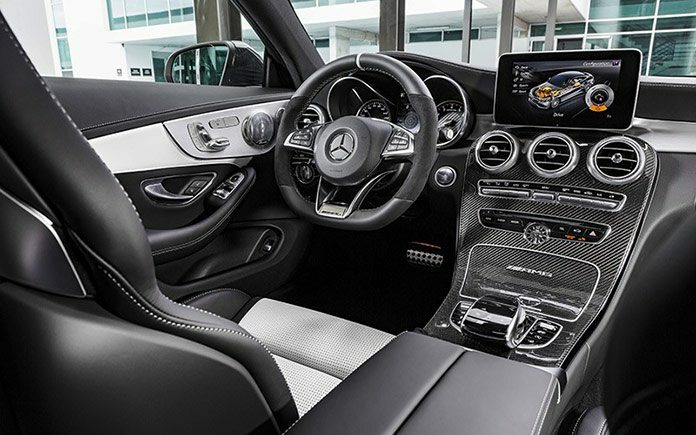 Numerous AMG-specific controls underscore the motor sport heritage. 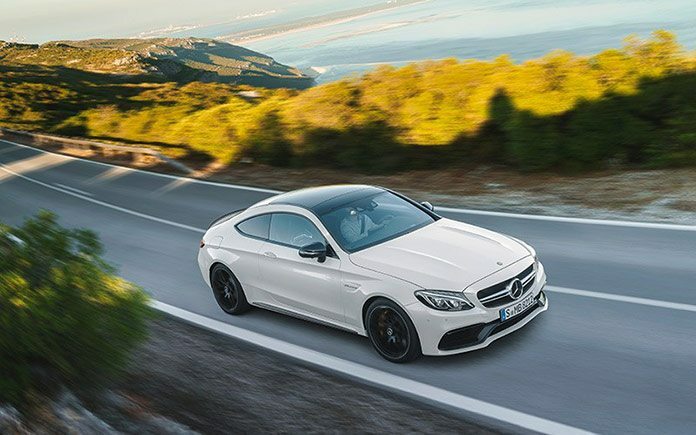 Also as regards its engine, the C 63 Coupé occupies an exceptional status among the competition, being the only vehicle in the segment to boast an 8-cylinder biturbo engine. Mercedes-AMG thus precisely meets the wishes of those customers who desire a combination of a highly emotionally appealing, unmistakable engine sound and high-torque power delivery. 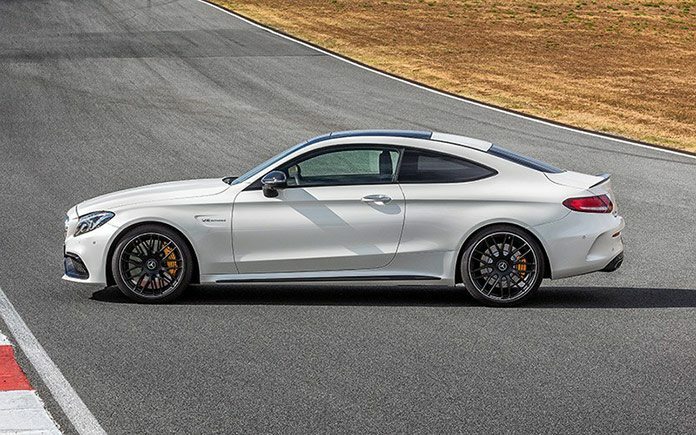 The driver also benefits from the impressive performance: the C 63 S Coupé accelerates from 0 to 100 km/h in 3.9 seconds, the C 63 Coupé in 4.0 seconds. The top speed is 250 km/h (electronically limited; 290 km/h with AMG Driver’s Package). With a power-to-weight ratio of 3.4 kg/hp (C 63 S) and 3.6 kg/hp (C 63), the new AMG V8 top models likewise head the field in this segment. The 4.0-litre eight-cylinder biturbo engine is already used in the C 63 Saloon and the C 63 Estate. It is also installed in the GT sports car with dry sump lubrication. A characteristic feature is that the two turbochargers are positioned not on the outside of the cylinder banks, but between them in the ‘V’ – experts call this a ‘hot inside V’. The main advantages of this design are the compact engine construction, optimal response and low exhaust gas emissions. The patented NANOSLIDE cylinder coating, which is also being used in Formula 1 racing today, reduces the friction of the cylinder liners and increases durability. By way of comparison: The surfaces of the cylinder liners of the AMG V8 engine are twice as hard as conventional grey cast liners. The closed deck design of the crankcase is likewise found in motor sport and ensures the crankcase’s extreme stability. Lightweight forged pistons lower the engine weight while offering supreme strength. 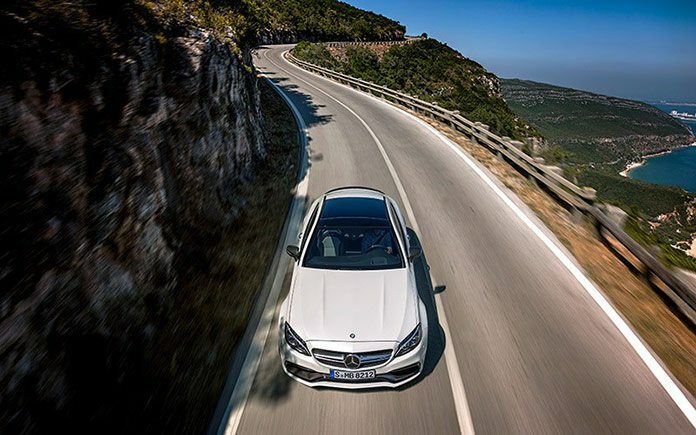 With the AMG RIDE CONTROL sports suspension, the customer is able to choose between maximum sportiness and pronounced long-distance comfort in three stages at the push of a button. The difference between the comfortable and sporty suspension setting is now even more perceptible – depending on the particular driving situation.The damping stages can be selected via the DYNAMIC SELECT driving modes or with a separate button. The four different driving modes “Comfort“, “Sport“, “Sport+“ and “Individual“ allow drivers to influence the characteristics of their C 63 Coupé. 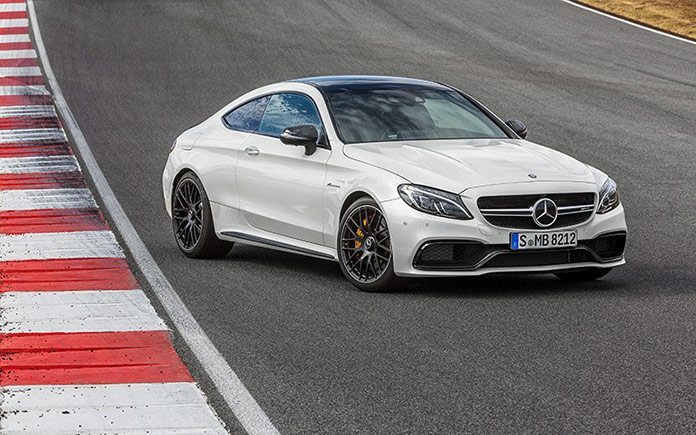 The C 63 S Coupé has an additional “RACE” driving mode allowing for a completely personalised driving style. The driver selects the driving experience using a controller to the left of the touchpad.